There’s a simple mantra out there that can really help with self-control. Especially emotional self-control. I’m not at all suggesting that anger is a bad thing, in and of itself. You get angry about something because it threatens your values. And we each have values that are important to us, and we’re ready to stand up for them, even fight for them. It’s the level or intensity of the reaction — the impulsivity involved — the non-thought-out, way-over-the-top immediate reaction that can be dangerous. Self-control is about learning how to filter, to manage your emotional reactions so that they become decisive responses to whatever is threatening you, disappointing you or just making you feel like you’re going crazy. Basically, you keep your mind hooked up to what your heart is feeling. And you respond, not react. Stephen Covey, in “The 7 Habits of Highly Effective People” said: “The ability to subordinate an impulse to a value is the essence of the proactive person.” So what does this mean? Proactive people, people who are doing something about problems that are around them, don’t act on impulse. They act on their values. They don’t let impulses guide their behavior. The woman started crying immediately. Her husband looked perplexed. “I’m not really sure why we’re here,” he said. The husband looked at first shocked. Then he became angry. Very angry. I thought he might get up and leave. I asked a few questions. How long had they been together? Did she know what was causing her unhappiness? It certainly sounded as if he was flummoxed by this move, and I gave both support for what was a very painful moment in their lives. I learned they’d been together for over twenty years. They’d had an affair before they married. They had two children, one in college and one a senior in high school. She’d been a stay-at-home-mom. He worked in a huge corporation and had done very well financially. It was a story I’ve heard a lot over the years — two people who’d both done what they believed they should, worked hard, raised their kids, but forgotten to nurture their own relationship. They’d likely never addressed problems with trust that arise when a marriage starts out with an affair. Whatever the reason, the pain was palpable in the room. He could respond, not react. He could decide what value was more important to him than flying off the handle. How do you respond when someone suddenly pulls in front of you when you’re driving? Do you get enraged? Or do you remind yourself that you’ve done that unintentionally as well, after you changed your mind about the best way to get somewhere? What’s more important to you — having a chance to get angry, or being understanding? What do you value more? The way you react is due to a lot of things. Maybe you’re triggered by something from your past, something that you’ve never resolved — something that’s keeping you from what I call being an “emotional grown-up.” Maybe you’re exhausted, and your over-reaction is due to being out of reserves. Maybe you’ve been angry or resentful for a long time, and your self-restraint is used up completely. Maybe you’re taken aback by something you’re not prepared to hear. So you explode. There are three things that can help with control of your emotions, while also giving the message that you care about the conversation. Let’s say you’re getting way too overheated in a conversation you’re having with your partner — and you’re starting to feel like you’re losing control of your emotions. 1. Recognize when you’re having an over-reaction. Stop and ask yourself, “Wait. is my reaction too intense? 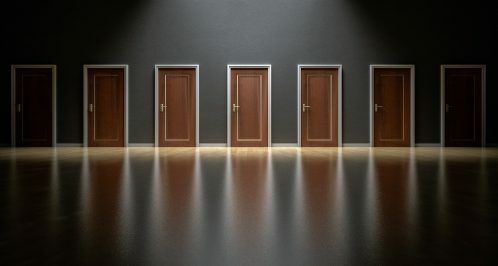 Is it rational?” The very act of stopping your emotions and questioning their validity can offer you the few seconds you need to realize you’re over-reacting. You can search for the reason you’re getting so highly triggered. If you’re tired, get some rest. If you’ve been resentful for a long time, get a book such as “The Dance Of Anger” and learn more assertiveness. If you’re being triggered by something from your past, journal or work with a therapist on just how that’s happening. When you understand, you’re far more likely to respond well. 2. Be careful if you need to choose to withdraw. You may need to leave a conversation in order to pull yourself together. You can reveal that you’re having an over-reaction — and that you don’t want to — and state you need time to think things over. You need time to try to understand what’s underneath your reaction so you won’t say or do something impulsive. 3. 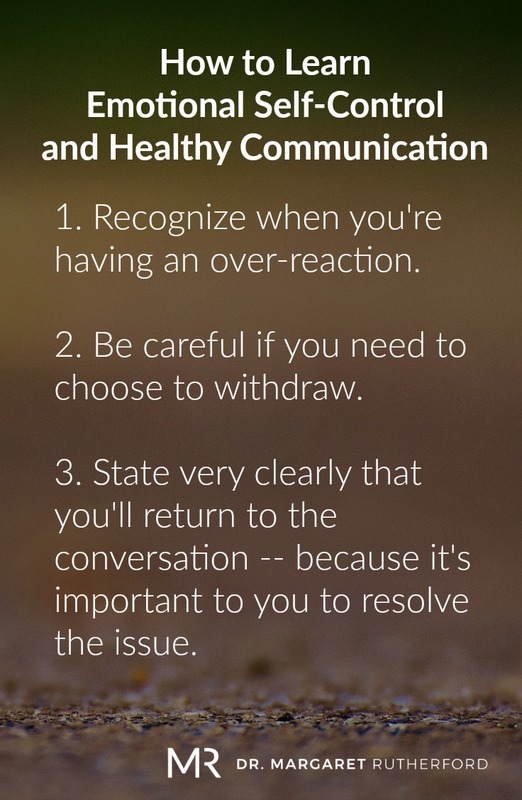 State very clearly that you’ll return to the conversation — because it’s important to you to resolve the issue. This last part is very important — the message that you will be back. Withdrawal can feel very controlling. If you disappear, go into another room, leave the house or immerse yourself in a video game, that can feel terrible to the other person. Saying you want to continue the conversation is a must. Otherwise, they’ll follow you and things are likely to escalate. It’s called an approach/avoidance pattern in psychology. By the way, the guy whose wife wanted a separation? He made the decision that he cared more about the marriage than he did his pride. He calmed down, He sat and listened. When they came back the next week, he’d helped her move out. They’d, together, talked to their children. He joined a men’s group and started exercising. She was gone around six months. And when therapy stopped, she’d been back in their home for around three months. Good things can happen when you think — when you monitor and manage your emotional reactions. And when what you value the most remains your top priority. Not getting even or getting mad. But understanding. And loving well.